I'll admit it... I've been slacking. I know I've let you all down, and I'm sorry. In my defense, things at INHockey HQ have been more than a little unsettled. Jeremy is up to his eyeballs in beer (literally... He's opening his own brewery, and I'm totally excited for him!) and will likely not be involved in things for the foreseeable future. I'm now running an ice rink in south Indy - which takes as much time and work as it sounds, and leaves me with very little time to watch games or write. But I'm not here to make excuses. I'm here to grovel for your forgiveness. I haven't given up on you, or Indiana hockey, and I'm going to head into 2019 with renewed enthusiasm. Not sure how much content I'll be able to crank out, but I'll do my best to keep you informed on what's happening in our fair state. The Komets and the Fuel are both off to solid starts, despite being in the bottom half of the conference. Indy is currently at #8 in the Eastern at 17-14-0-0, while Fort Wayne is nipping at their heals at 16-14-0-1. Tight doesn't begin to describe the ECHL East, as a mere eight points separate 3rd through 11th place. The Fuel wrapped up 2018 with a bit of a run, winning 3 of 4, while the Komets earned a split in their final four games. The two will square off five times over the first month of the year, and three of those will be in Indy. Either team (or both) is capable of making a push to the top of the conference. And with three full months left before the Kelly Cup Playoffs begin, just about anything can happen ...and probably will. Year three has been a struggle for the Evansville Thunderbolts. Building a new franchise usually is (Vegas withstanding), but after finishing 27-20-9 and making the playoffs last season, we wouldn't expect things to be this rough. The road has not been kind to the 'Bolts, who are still searching for their first win away from the Ford Center. Good news is that Evansville plays 5 of their first 6 games in 2019 at home. It took some time for the D-I Fighting Irish to find their stride, but things seems to have settled into a groove in South Bend (the 9-1 thumping by Penn State to close out the first half notwithstanding.) Notre Dame started the season swinging from solid wins to close losses before rattling off eight wins in their last nine games. 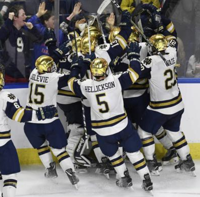 The Irish rang in 2019 in must-see fashion, dominating former Hockey East foe Boston College on New Year's Eve 4-0, and will open the new year with an outdoor tilt against conference rival Michigan on the NHL Winter Classic ice. If you need a better reason to visit South Bend, you'll have to ask someone else because I can't give you one. With three teams in the USCHO.com rankings, early returns place the B1G as one of the toughest conferences in the nation, right up there with the NCHC. Barring a monumental collapse, don't be surprised to see the road to the Frozen Four clogged with B1G traffic. Only in year two, Trine continues to build their NCAA teams with a slow and steady approach. Both clubs have made strides from last season, with the ladies fairing better than the men. The Thunder women hit the holiday break with a better than .500 record (5-4-1) and in the upper half of the NCHA standings. Unlike last year, the boys didn't have to wait until the middle of December to notch their first win but success has been tough to come by. The Thunder faced some stiff competition in the first half, and despite closing out 2018 with a 3-0 shutout against SUNY-Canton, still sit near the bottom of the conference at 4-8-1. Things should get a little easier in 2019, but the road ahead won't be without its bumps. Indiana Tech had a disappointing end to an otherwise stellar 17-18 season, bowing out of both the WHAC and National Tournaments with loses to Aquinas. Last January, the ACHA voted to disband the NAIA division and return to the three men's and two women's divisions. While this was a bit of a setback for the return of NAIA hockey, they simply rebranded as the NAIHA and continue to march forward. The Warriors kicked off the new season with four wins in their first five games before stumbling a bit over the next couple weeks. Tech righted the ship though and ripped off 10 straight wins to go into the winter break on a high note. They currently sit two points behind Aquinas for the WHAC lead, as having split their season series with the Saints, look for these two teams to battle it out again in the postseason. 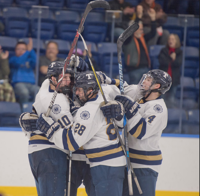 Trine's ACHA M2 team took the nation by storm in their inaugural season, going undefeated in the regular season and earning an automatic berth in the National Championship tournament. Year two has been a bit tougher for the Thunder, but after an up-and-down start have managed to climb to #4 in the Central with a five-game win streak. With some challenging games ahead on the schedule, its certainly can't hurt that things haven't come so easy for the Thunder this time around and they've had to grind a bit. They'll be better prepared for the tourney should they earn a return trip. It's been nothing short of a hockey revival in Bloomington thus far. Stating that last season was a disaster would be selling the Hoosiers short for all the trials they endured. Armed with New(man) attitude, the Hoosiers have reversed their fortunes with a 12-5-1 record and a #14 Central ranking. More impressive still is the 9-3 record outside of B-town. Slated to join the TSCHL next season, a trip to the playoffs would be a nice wrap-up to an already successful campaign. But don't expect the Hooeys to rest on their laurels. After last year, these boys don't take anything for granted. It would come as no shock if ICHC chose "Good Times, Bad Times" as their theme song for last year. The conference was riding high in the early going, having gained the chance to send a team to the All-Star Challenge in April and landing a rep on the M3 Select Team (IU's Kody Wagner) for the Student Hockey Challenge in Russia. Additionally, they added three new teams - Miami (OH), IUPUI, and Trine - to bring the conference roster to eight. Yet trouble at Purdue and a lack of players at IUPUI ended those two teams' seasons before they began, and the ICHC was stuck at six. Still, the addition of the Redbirds and the Thunder has been good for the conference. #5 Indiana (10-1-0-1) has run the table the past few seasons, and while there's a chance they will again, things won't be quite so easy now. The Hoosiers are also looking for a return trip to the ACHA Playoffs, and there's a outside chance that both Trine (#12) and Miami (#18) could join them. Personally, we'd like to see Indiana Tech and Notre Dame's M3 teams join the ICHC in the next season or two. Adding the Warriors (Central #10) and the Irish (#14) would add some serious clout to the conference and could help some of the other programs who are struggling to gain traction. A 10-team conference - provided Purdue and IUPUI are able to pick things up again - with north and south divisions would make scheduling and travel relatively easy. Nine or eight teams would still be a big step in the right direction. Another thing we hope to see in the near future is growth in the women's game. The Thunder look to be on solid footing, but the Irish (ACHA W2) are playing fewer and fewer games and are only slated to take the ice 10 times this season. Two games a month makes it tough to build a program, and although ND has some quality players on the roster, it's hard to attract recruits with such an abbreviated schedule. 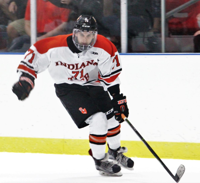 The Michiana League is making its presence known on the ice and in the rankings. This is the area where I'm the most dissappointed... in myself. There is some damn-good hockey being played in the prep leagues, and I haven't done nearly enough to tell you about it! Can't promise that my life will get any less complicated over the next few months, but I will share what I can both here and on social media. Let's start with the obvious. Culver is good. They're always good. Some years are better than others, but you can depend on the Eagles to be at or near the top of the rankings and battle for the state title. Zionsville came up a little short in the playoffs last year, getting edged out by Culver in pool play. This year's Eagles have picked up right where they left off, racking up 20 wins and a #3 ranking (MyHockeyRankings.com) in the first half of the season. Look for Carmel (Gold) and Bloomington to push Zionsville, though, having split both series in the regular season. As dependable as death and taxes, the Michiana League is pumping out some rock-solid hockey teams. With four teams in the MyHockeyRankings.com Top 10 - LSJ, Adams, Penn, and St. Josephs's, and Riley just outside at #13, the only consolation other clubs can take is that perhaps they'll beat each other up so much during the regular season that things will be easier in the playoffs. Don't count on it. There's still way too much to talk about in this not-so-little article (looking at you, Carroll!) so look for some follow up pieces focused on what's happening on the prep circuit. Going forward, we'd like to see the ISHSHA step up their promotion game and shine some light on the sport. After all, if you want to grow the game, you got to put it out in the sunshine. Putting the league standings on the front page of the website, along with a little news, would be a great place to start. Making a big deal out of the state playoff tournament would also be a smart move. We certainly don't expect to turn into Minnesota overnight - drawing over 18,000 fans to the AA Championship at the Xcel Energy Center is setting the bar more than a little high. But running the tournament at Bankers Life or even the Indiana Farmers Colesium would add a little prestige to what is supposed to be the highlight of the season. Don't think we've forgotten about youth hockey. Far from it. The sport continues to grow and evolve in our fair state, but covering it all here would be excessive. We'll give you the lowdown on what's happening in the youth arenas in the coming weeks, so stay tuned! No real earth-shattering news here, but hopefully you're caught up on what's gone down in the first half of the season. I can't promise a gluttony of content going forward, but I'll do my best to fire something off every week to keep you informed. That being said -- if you've got a connection to the game and know of a story to share, send it our way! Obviously we can't be everywhere all the time, so you can help keep your fellow Puckheads informed by dropping us a line. Got the writer's bug and want to see your name in print? Shoot us a story and we'll give credit where credit is due! There's no money, of course... this is a labor of love. We don't get paid either (yet). Same goes for you Shutterbugs -- send us your pics and we'll post them on our site or social media pages!